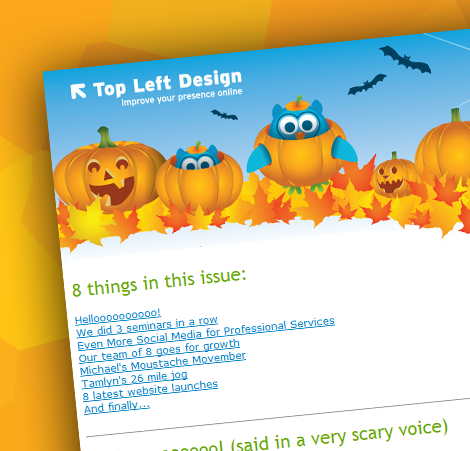 We have just sent our latest newsletter masterpiece and this newsletter was dedicated to the number 8. We all worked on it – writing copy, coming up with all the little details, checking for typos, putting together the HTML and images – a real team effort! Thanks to all those who helped with proofreading our test previews! Blogging For Business – Tuesday the 29th March from 12 noon to 5pm! Let’s say you launch a new business website, it’s nicely designed and up to date, and and tells the world all about the services you offer. 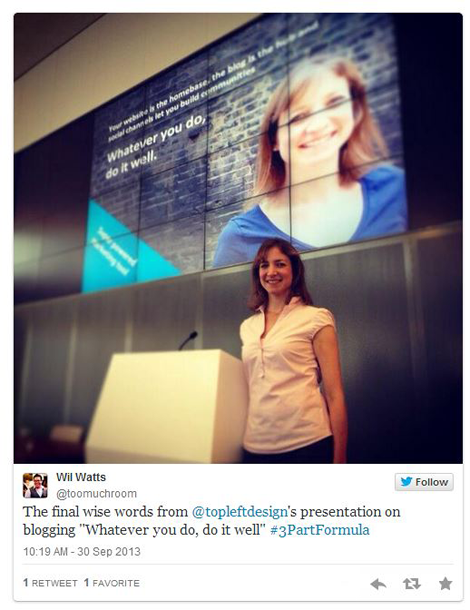 But after a couple of months it’s not feeling quite so up-to-date – The answer is blogging – and learning about blogging from Top Left Design! A good blog on your website can ensure that your website is constantly ‘current’, and lets visitors know that your company likes to keep track of what is happening in your particular niche. Not only does it broadcast your company’s motivation to keep it’s online presence in the here and now, but blogs are also a fantastic outlet for you to share relevant information to your industry, gain valuable feedback, and discuss topics that are on the forefront of your businesses interests. Of course, not everyone is born with the ability to write easily. Nor does everyone have the time to sit around writing – especially after a long day doing the “more important things” that your working life demands. And we want to help you “improve your presence online”. For most businesses, whether they are B2B or B2C – blogging has to be a major part of the marketing plan. Many studies have shown that blogging not only improves the impression people have about your business, but also generates a huge amount more traffic and visitors to your site. Partly because blogging allows you to add more pages easily to your website, and partly because there is much more current and interesting information on your site for people to see. Many people find that, surprisingly, writing can be therapeutic – a good way to relax and unwind. What’s more, every word you write contributes to the worth and influence of your business. We invite you to learn from us! We would love you to visit us at Top Left Design and attend one of our London-Famous blogging seminars – the perfect tutorial and motivational boost, which will send you on the correct path, ensuring you do not waste your time by doing things ‘wrong’, and begin your blogging endeavour with only the good habits. All of our seminars are also CPD Certified! Other things we will think about before then – we are ideas people! It’s one thing to write a blog post, but without practising a few simple rules, it could all be for nothing. In our seminars, I lay down the golden rules of blogging, and give precise tips on how to effectively write Google-friendly posts, to generate inbound traffic to your site, along with invaluable instructions to cross-promote your blog (and website) using various free social media platforms like Twitter and LinkedIn. Tina will even be doing a guest slot – on her birthday, no less! Of course you won’t only be learning, there will also be a fully catered (healthy) lunch! 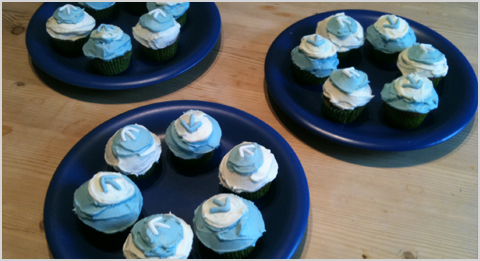 Which should ease away some of the guilt incurred by your current lack of blogging, and also our famous Top Left Design cupcakes (homebaked and branded by our very own Tamlyn! ), which you be challenged to resist!